Looking for the cutest first birthday boy outfit or woodland birthday shirt? 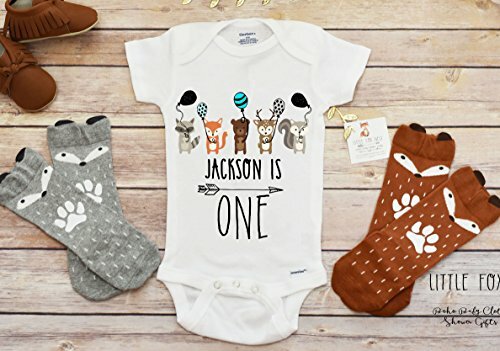 This adorable personalized woodland creatures bodysuit or clothing set (3 pieces includes the 0-9 month hat, shirt/onesie, and fox socks in your choice of color) makes the perfect addition to your little ones wardrobe or special gift- am I right? Makes a great Baby Shower Gift. Perfect for Boho, Rustic, Woodland Critters, Fox Lovers and more. We use Onesies® brand one-piece underwear by Gerber for newborn sizes, and we use Laughing Giraffe brand (similar to Carters) for all other sizes. Gerber Brand Onesies® run a size small. Laughing Giraffe runs true to size or slightly big. Shoes not included. If you have any questions about this product by TheCritterNest, contact us by completing and submitting the form below. If you are looking for a specif part number, please include it with your message.